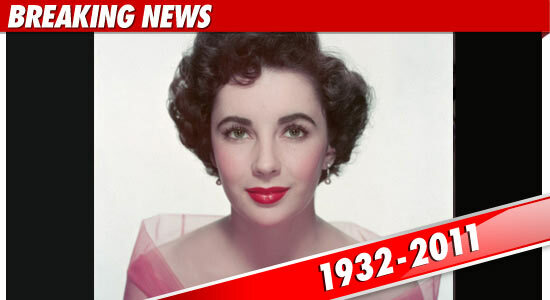 Elizabeth Taylor died this morning at the age of 79. Taylor died at 1:28 AM at Cedars-Sinai Medical Center in Los Angeles ... where she had been hospitalized for the past couple of weeks. A private funeral will be held later this week. Taylor's publicist says she was "surrounded by her children -- Michael Wilding, Christopher Wilding, Liza Todd, and Maria Burton." Taylor's rep says the actress died "peacefully" from congestive heart failure, "a condition with which she had struggled with for many years." The rep adds, "Though she had recently suffered a number of complications, her condition had stabilized and it was hoped that she would be able to return home. Sadly, this was not to be." Someone at the hospital Tuesday night tells TMZ ... doctors knew at around 6 PM that Taylor was dying. Taylor was considered one of the greatest actresses of all-time -- starring in classics like "Cleopatra" and "Cat on a Hot Tin Roof." She won an Academy Award for best actress twice for her roles in "BUtterfield 8" and "Who's Afraid of Virginia Woolf?". Taylor, who was married 8 times -- twice to Richard Burton -- is survived by 4 children, 10 grandchildren and 4 great grandchildren. Taylor's son, Michael, says, "My mother was an extraordinary woman who lived life to the fullest, with great passion, humor, and love." Michael goes on to tout his mom's "brave and relentless advocacy in the fight against HIV/AIDS ... We know, quite simply, that the world is a better place for Mom having lived in it." Elton John says, "We have just lost a Hollywood giant; more importantly, we have lost an incredible human being." Dr. Arnold Klein, Taylor's longtime friend and doctor, tells TMZ, "She's the greatest human being I've ever known. She used her celebrity not just for fame but to change the world. Elizabeth gave AIDS a face and that's when people started accepting it as a disease." We've learned Taylor has a plot next to her parents at the Westwood Village Memorial Park Cemetery in L.A. Among those who are buried or interred there -- Marilyn Monroe, Natalie Wood, Truman Capote, Farrah Fawcett, Dean Martin and Walter Matthau. The family asks in lieu of flowers that contributions be made to the Elizabeth Taylor AIDS Foundation -- elizabethtayloraidsfoundation.org. 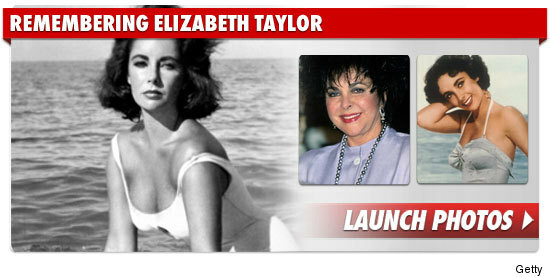 People wanting to send personal messages can log onto http://www.facebook.com/ElizabethTaylorTribute.